Tagged under Square Enix, Final Fantasy, Series. Two years after the defeat of Sephiroth by Cloud and his gang, a new danger reappears. This danger is Kadaj. He and his two brothers are out to get the cells of Jenova in order to bring back Sephiroth. Cloud, in order to stop it, must pick up the sword once again and join in the fight. 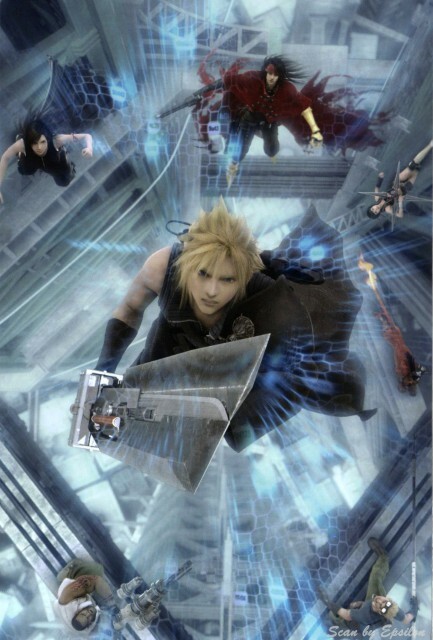 With the help of the Turks and the former President of ShinRa, and his fellow friends, Cloud must prevent this danger and save Midgar and the world once again. This movie was by far the worst of its years. Just to plainly say it out: I did not like it. At all(Hate is a very strong word...). This movie is 90% violence, and the 10% was Cloud's problems. WE DON'T CARE ABOUT YOU AND YOUR NEEDS, CLOUD! The fighting scenes happened too fast and too inhumane for the human eye to actually take it all in. The producers treat all the characters as if they were gods, and thus make them very un-realistic. Hopefully, if they make another movie, they can fix their mistakes and make a better, more complete movie. When I first saw it I was in disbelief.. "People don't make movies this good & this accurate anymore.. Maybe what I saw was just some dillusional dream" I watched it again the next day to literally confirm what I just saw... almost 3 years of waiting including an extra year "delay"... It. Was. Worth. It. I love the action scenes especially the fight of sephiroth and cloud love the sword clashing as well special and visual effects in the movie. An ex-mercenary is forced out of isolation when three mysterious men kidnap and brainwash the city's children afflicted with the Geostigma disease. This was a good movie for Final Fantasy VII; however, it was much too short. Flushing out more of what happened between the end of the game and the start of the movie could have helped it out a lot. The movie producers and directors leave too much up to the viewer to interpret from the little information that is provided. The Final Fantasy franchise could benefit from more movies and manga. I love action movies. Either that anime, 3D, etc. Thats why this FFVII ACC is my favorite. I played FF VII game. That make this movie becomes more memorable for me. The actions are cool. The martial arts styles also great. Kinda over-power n not logic, though. But hey! This is from Fantasy world! of course this kind of elements shouldnt be so surpraising. 80% of this movie contains fights. The 3D graphic, as always for FF standard these days: Great!. I've seen this movie a good number of times. I love watching it in both the dub and the original Japanese voices, as I thought both casts sound really good to me. Loved the animation, it was awesome. The CGI is really nice. Everything was pretty smooth. The fights I thought were really good. I wish there was more Kadaj and Sephiroth though, since I think they're both really awesome characters^^ I also wish there was a bit more of Vincent. Some of the music was pretty good as well. I don't really care for Yuffie. I wished Cloud stopped trying to handle everything on his own and relied on his friends more. I also really wished Tifa's fight was a bit longer or it would've been interesting to see her have another battle. A gift for all us FFVII fans: the art is for everybody, so is the fighting and dynamic scenes... but the story, the referents, the final message is just for the ones that have been in those magic lands before (otherwise, you can't possibly understand it at its full), period. The first movie although it didn't have much of and explanatory story for the people who played the game but still was humongous-ly liked so they decided to make a 'complete' version and i really liked it. They added almost 30 minutes to the movie but the action was good and you could get almost all of the story. An excellent CG movie recommended to any Final Fantasy fan or anyone in general. The animations and especially soundtrack are stunning, and the story goes from being totally awesome to even more than that. Definitely recommendable~! The most favorite movie for me in Final Fantasy 's series. Very nice graphic effect and 3D effect on movie. Very good story line and easy understand even thought just watch 1 movie. Cloud plays the main role on story, but never neglected others characters in this movie. The good old Final Fantasy VII's CGI movie takes place two years after the events of the game. The animation is amazing and the graphics look really good. The textures, everything. The music is just the classical Final Fantasy stuff, I wasn't impressed myself. The story is pretty bad of the movie, even for the Complete version plus Denzel's animated special episode. I'm saddened by the change of personality of Cloud, but it's still fun to have seen it because you don't see a CGI movie just everywhere now, do you? This film looks so beautiful, it is made very good, and also the characters are very beautiful, especially Kadaj and Tifa ;D Unfortunartely the story isn't that interesting, it could have been way better I think :/ Still if you are a fan of Final Fantasy VII, you shouldn't miss out this film! great cinemactic effect. felt more like a movie than your average anime. characters great with personality. artworks smooth and flows nicely. story rational and developed from a problem and ended with style.